Alcoa has donated 80 acres of wetland habitat in Evansville, IN, to Sycamore Land Trust for permanent protection. 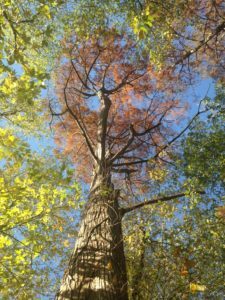 The land contains a rare bald cypress grove and excellent habitat for wildlife, and expands the amount of protected land Sycamore holds in Vanderburgh County. This wetland property is located near, but not adjacent to, Sycamore’s Eagle Slough Natural Area. Eagle Slough is 127 of wonderful wetland and bottomland forest, and is a beloved spot for birders to visit because of the more than 160 species of document birds seen there. The 80 acres from Alcoa in this addition will provide further habitat for the species that depend on Eagle Slough. Because this parcel of land is not accessible to the road, Sycamore Land Trust will not be able to make it available to the public. However, a visit to Eagle Slough provides a great opportunity to hike a similar wetland, which has had more time to mature. Visitors to Eagle Slough can enjoy the educational signs posted along the way, as well as the overlook deck which the Alcoa Foundation donated the funds for several years ago. To acknowledge Alcoa’s generosity and this exciting addition to Sycamore’s protected land in Evansville, a small reception and press event will be held at Eagle Slough Natural Area (5000 Waterworks Rd) on Thursday, January 25 at 2pm CST. For more information, please contact Abby Henkel, Sycamore Land Trust Communications Director, at abby@sycamorelandtrust.org or 812-336-5382 ext. 101. About Alcoa: Alcoa (NYSE: AA) is a global industry leader in bauxite, alumina and aluminum products, with a strong portfolio of value-added cast and rolled products and substantial energy assets. Alcoa is built on a foundation of strong values and operating excellence dating back nearly 130 years to the world-changing discovery that made aluminum an affordable and vital part of modern life. Since inventing the aluminum industry, and throughout our history, our talented Alcoans have followed on with breakthrough innovations and best practices that have led to efficiency, safety, sustainability and stronger communities wherever we operate. Visit us online on www.alcoa.com, follow @Alcoa on Twitter and on Facebook at www.facebook.com/Alcoa.